. Currently our squad is highly and mosty High Command. KVD is where most of the elite are born and made into the elite. We enjoy squad nights, and "Get together" squad meetings. 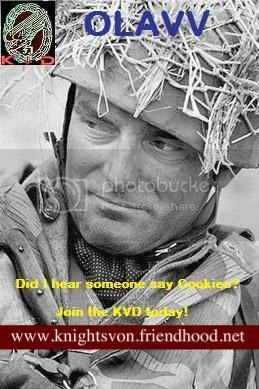 KVD is a HC member squad of the 2nd Fallschirmjager, 2nd Gruppe. KVD would be more then willing to accept any new players to the game. You would make the greatest meaning to KVD. THANK YOU FOR CONSIDERING THE KNIGHTS! I remember back in 2007 when you guys took me in. Had alot of fun with you guys and alot of memories were formed. Maybe I'll think about rejoining. New Squad XXO - Wooker2 CONGRATS! To the Top! 8:39PM EST! the wookie has spoken! and has called for the top slot! Rar rar rar to the top! How are you Knights going? ello dale! good over here, hows it on the other side? Bump right to the top!